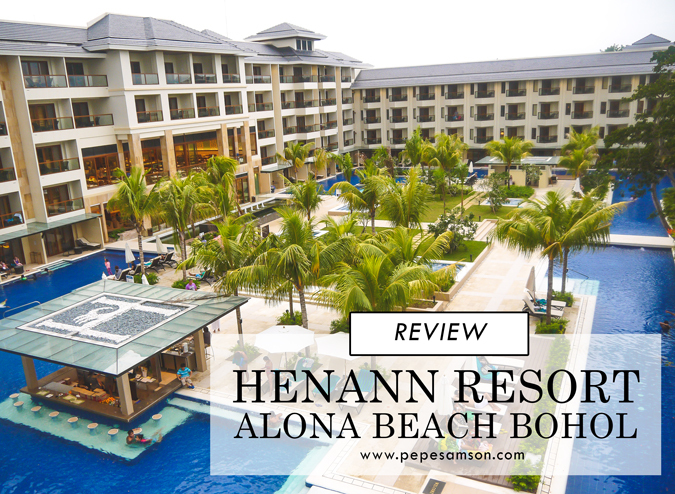 If you have stayed at the tropical haven that is Henann Resort in Panglao, Bohol, then you know that it’s one of the most relaxing and luxurious getaways in the Philippines. Just waking up on its plush bed and greeting the morning in your own verandah is a real treat—and it becomes even better the more you take in your astounding view of the lovely pools and the cerulean beach beyond. 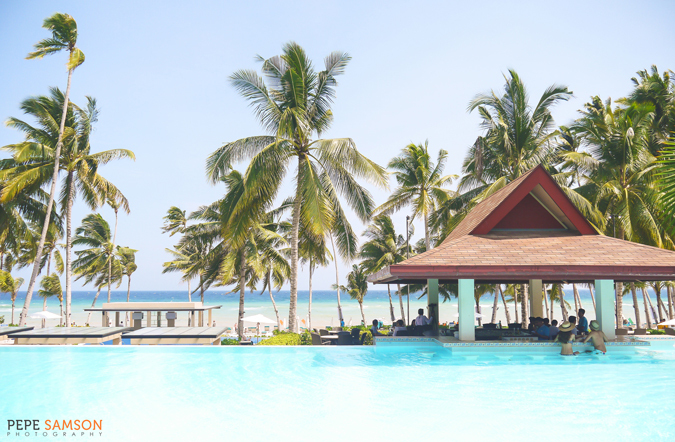 Stepping into one of its many pools is like getting lost in a newfound paradise; climb out and simply lounge about with a cocktail or two, and you have my exact definition of bliss. Indeed, at Henann, every moment counts, but you don’t need to rush to spend your time. 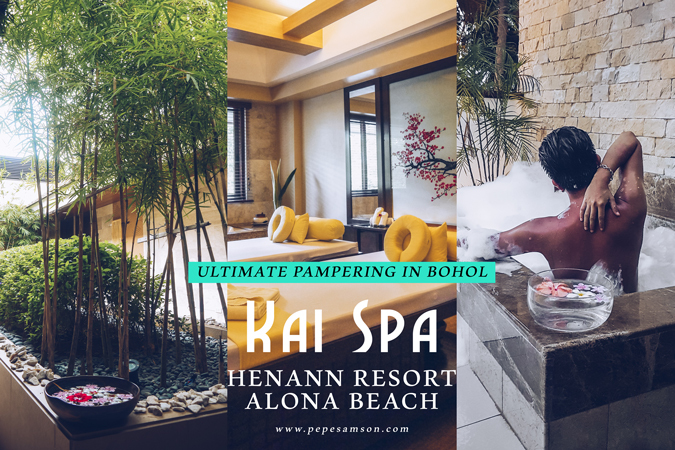 But just when I thought that the resort is perfect as it is, I discovered the ultimate escape when staying at Henann Bohol: the Kai Spa. 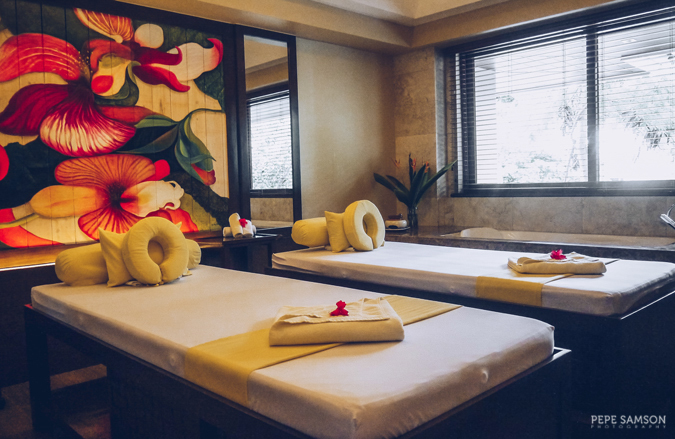 Carrying the same luxury spa brand as Henann Regency in Boracay, Kai likewise offers the whole range of massages and treatments available in the resort group’s flagship property. 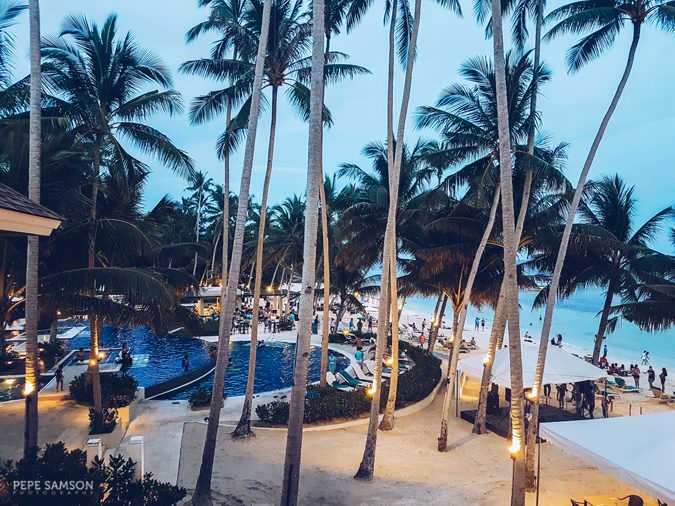 And while Boracay’s has a more traditional ambience (more about this soon), this one in Bohol showcases a bit of Japan’s modern side—fresh, yet still as tranquil as any spa should be. 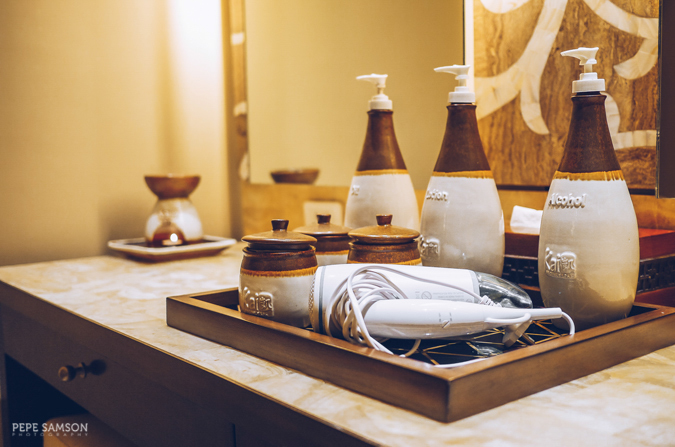 Situated beside the Sea Breeze Café, Kai Spa houses a number of amenities designed to provide a holistic spa experience. There are, of course, adequate massage suites—some ideal for groups or couples; some with indoor tubs; and some with outdoor whirlpool baths. There are dedicated rooms for facial, body, and foot treatments. 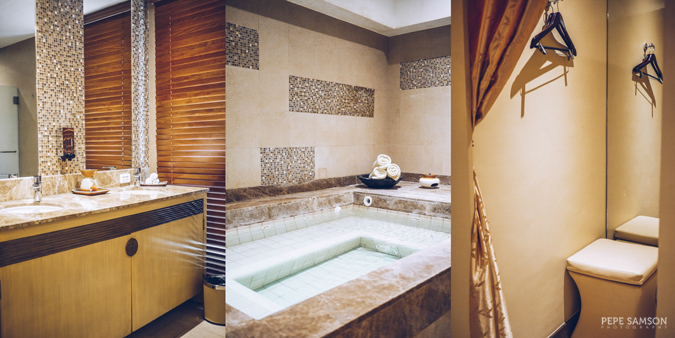 Separate shower, locker, and tea areas for men and women are available, complete with steam rooms and Jacuzzis. 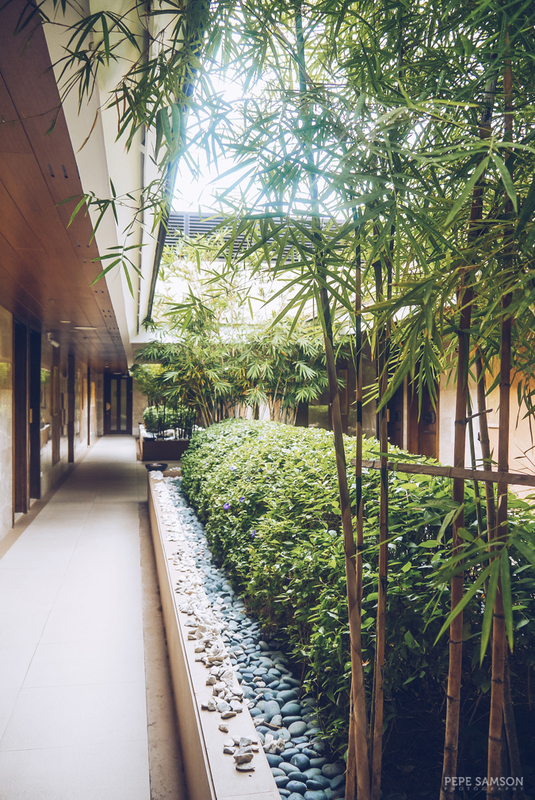 While guests can walk in anytime, it is highly advised that you make a booking before proceeding to the spa. When you book, you will be asked to fill out a waiver form which details your medical/allergy concerns, as well as your special requests (i.e. you’d like the therapist to focus on your upper back). The friendly receptionist will then ask you to choose your preferred massage oil—I always go for lavender, orange, or peppermint. You will be advised to come at least 30 minutes before your appointment, so that you can still shower and use the thermarium. Tip: check if your chosen treatment has complimentary use of this facility. If not, you can still avail of it for an extra fee. 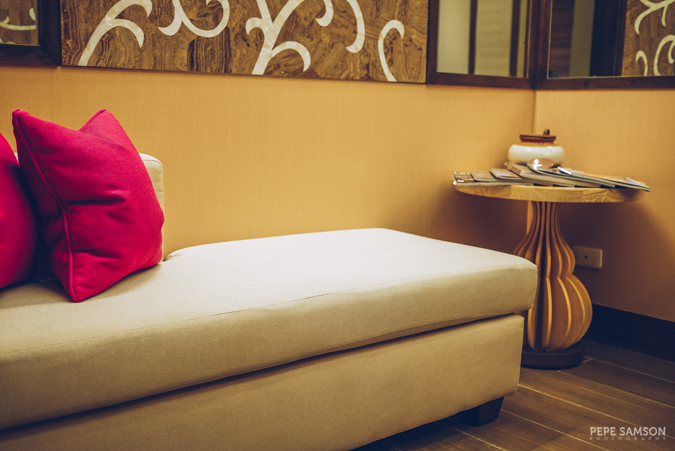 Once you’re ready, the staff will offer you some tea and your therapist will then take you to your massage suite. I requested for the Henann Suite (good thing no one else booked it for that time slot! )—a spacious room with two massage beds, two chairs for the foot wash, a bathroom, and a private balcony with a whirlpool bath and an amazing beachfront view. I love it!!! 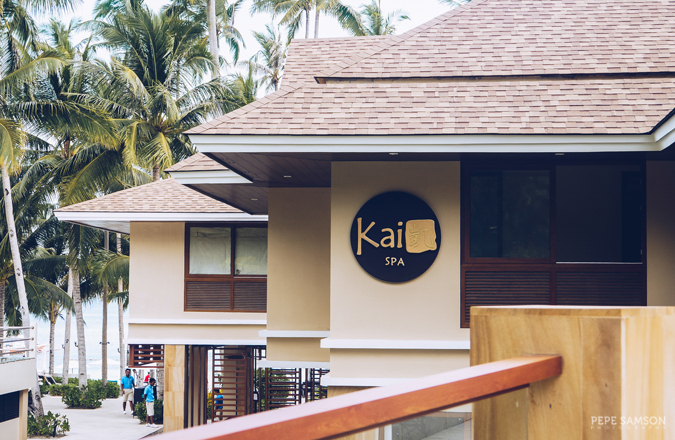 The spa couldn’t have found a more fitting name—the word “Kai” literally translates to “soothing”. 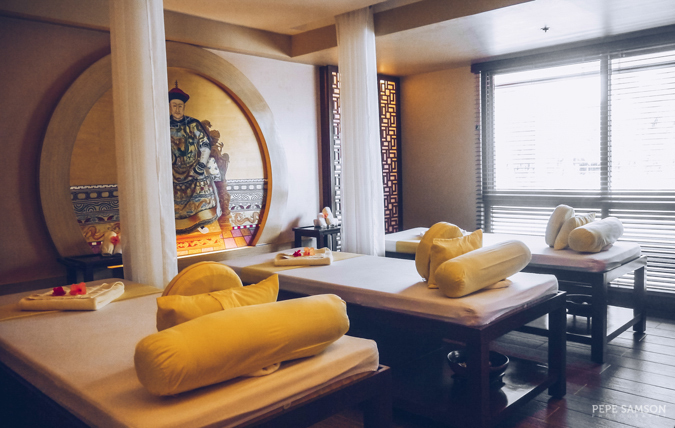 I was with my mother, and we chose the Nature Soothing Ritual (PhP6,300 for two), composed of 1 hour Kai Balance Massage and 1 hour Oriental Foot Reflexology. I found this package good value for money as the two treatments cost PhP2,600 and PhP1,600 respectively, which will set you back at PhP4,200 for only one person. Do the math: you will save PhP2,100 if you take the package. The two therapists asked us to take our seats for the ceremonial foot wash—salt to cleanse our feet, petals for happiness—and after which, we were asked to lie on the beds. 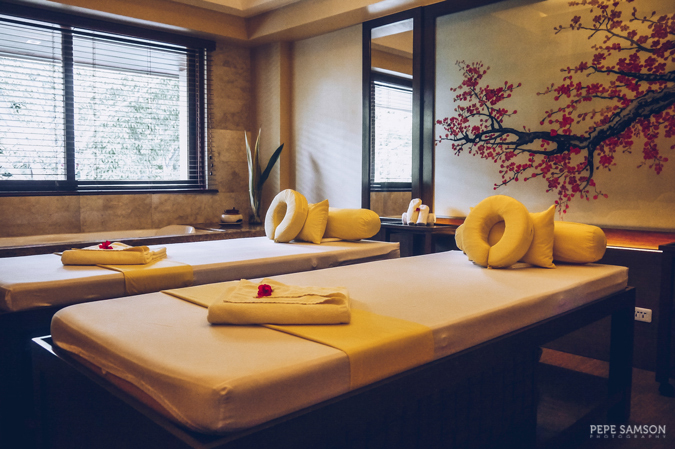 They struck the serenity gong simultaneously, signaling the start of the massage, and once they handled our bodies with their expert hands, all I could do was succumb to this much-needed pampering. The Balance Massage is a traditional Swedish massage fused with Asian techniques, aimed to stimulate blood circulation and relieve tensed muscles. Indeed, I kept on dozing off all throughout the massage, as the therapist attacked my tight shoulders and upper back. How can these women be so firm and powerful? I try to give massages to friends but I’m next to useless. After 1 hour of blissful strokes, the Foot Reflexology came next, which is designed to clear any blockages of energy channels in the body and balance the flow of Qi. The therapist placed an eye mask on me so I couldn’t see what she was doing, but aside from her hands, she was using some tools to stimulate my feet. Ah, what a delight! Let me tell you what I noticed all throughout our 2-hour treatment—the therapists are perfectly in sync. It was as if they knew how many strokes to do or what, but they always do the same things to me and my mom and mutter the same words (part of the ritual). Amazing! 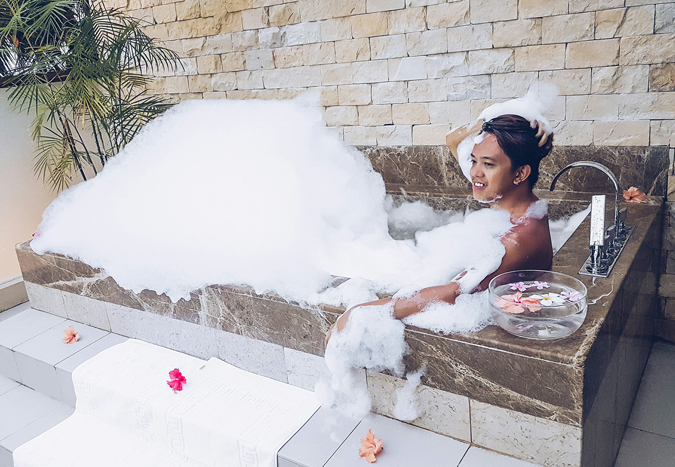 After our massage, I asked if I could use the whirlpool bath in our verandah for a few minutes (it wasn’t part of the package) and the awesome staff of Kai Spa obliged. YAY! And so I soaked up in petals and bubbles, relishing what remained of the afternoon sun while my mom enjoyed her ginger tea and cookies. I could hear the faint music from the beachfront pool bar downstairs but I didn’t care. Needless to say, I left Kai Spa with a big smile on my face and a very light feeling all over. The therapists at Kai are soooo amazing guys! Don’t forget to leave some tip in the gratuity box in the receptionist’s desk! 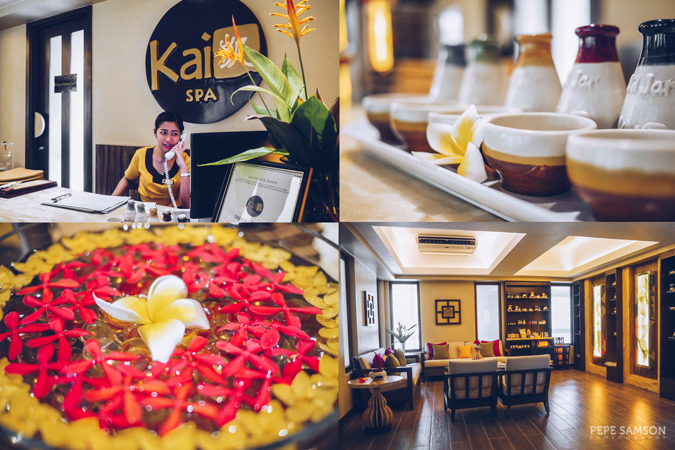 If you’re staying at Henann Resort (or nearby) soon, drop by Kai Spa and check the range of pampering services they are offering. 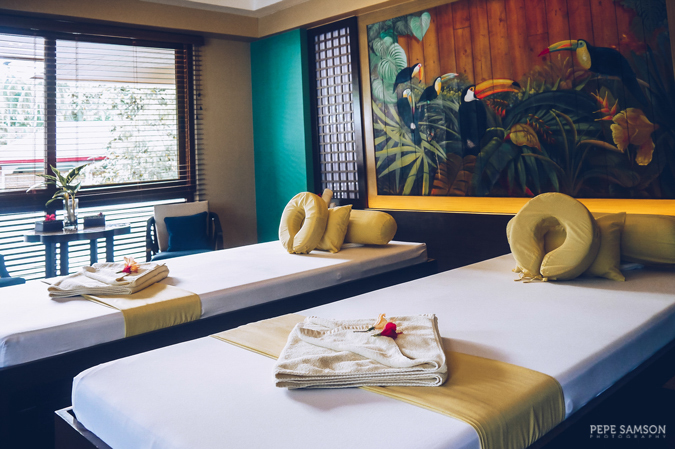 Whether it’s a massage, a body scrub, a facial, or a foot spa, I’m sure you will find one that will take your Bohol vacation from great to perfect. Details below! P.S. : I personally prefer the Kai Signature Massage over the Balance Massage. Read about the signature massage, soon! 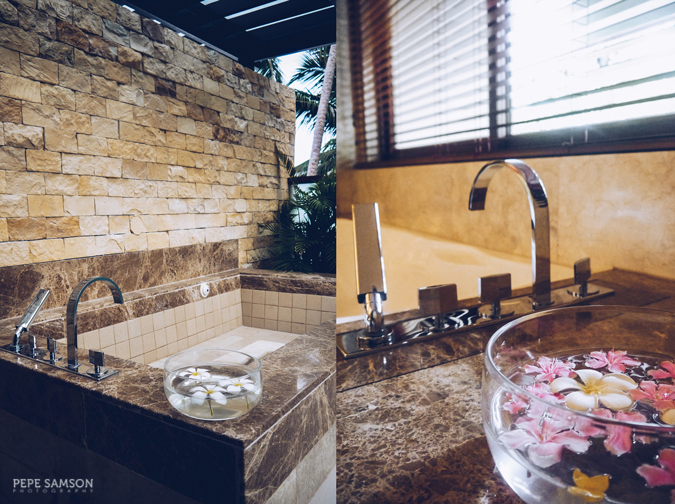 Thank you Henann Bohol for the wonderful spa experience! 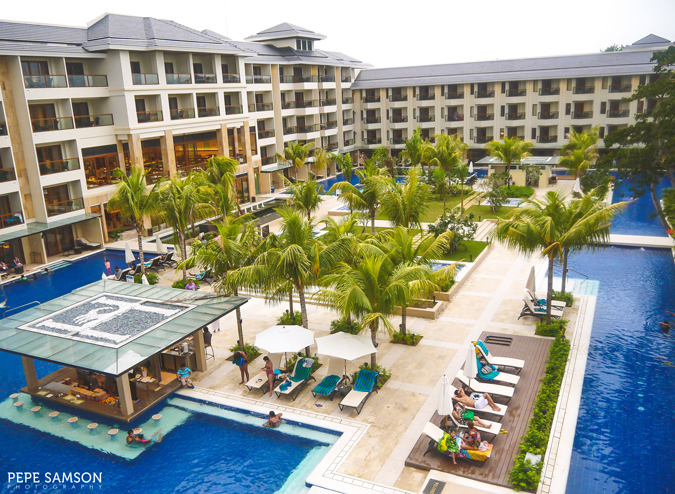 Have you stayed at Henann Resort in Bohol? 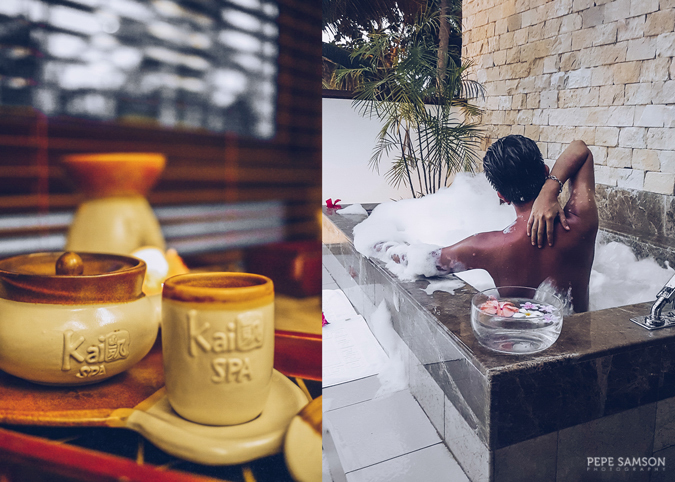 Have you tried Kai Spa? Share your thoughts in the comments section!